Stained Glass Front Door Las Vegas: Why Do Old Windows Have Wavy Glass? Why Do Old Windows Have Wavy Glass? If you’ve ever visited an antique home, you might have noticed that its windows look different from the ones in your modern home. 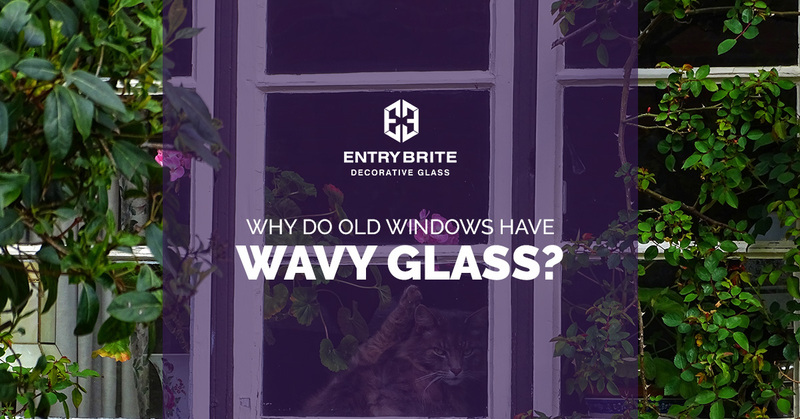 Often, glass in older homes has a wavy or textured appearance to them. These waves can distort the image of what’s beyond the window in many cases. But what causes this? Does glass sag or warp with time? In today’s blog, the stained glass experts at Entry Brite will take a look at this fascinating phenomenon. The fact of the matter is that wavy glass was actually made like that. While by today’s standard, this glass might look strange or even a little off-putting, for much of the 19th century, having medium to large panels of glass at all was quite the advancement in technology. Wavy glass was made in two distinct ways for much of the 19th century and even into the early 20th century. It’s only recently that glass making has been done by machines. For a long period of time, glass was made by hand by glass blowers. Crown glass was one of the first ways to affordably make glass for use in the home. Crown glass is made by blowing glass into a hollow globe. This globe was then reheated and spun until the bowl flattened out into a disc. The glass could then be cut into shape. These pieces of glass were unique for its particular pattern that resembled a bullseye. This is because the glass was thickest in the center of the pane, and got thinner as it moved to the edges of the glass. By the time of the Second Industrial Revolution in the mid-late 19th century, people were increasingly relying on machines to take over delicate work like creating glass. One of the ways to make glass was by extruding a tall and large tube of glass. In some cases, these cylinders were nearly 40 tall and then were cut down into smaller sections on 10 feet long. These smaller tubes were then cut in half and reheated so that they could be flattened and then cut to fit a window frame. The process of creating the initial cylinder, and then reheating a portion of that glass tube cause waves to form in the glass as it may not have heated evenly, or the heat caused bubbles or ridges in the glass. So, wavy glass isn’t a product of time or the elements, the glass doesn’t sag, it was just made that way. Even today, glass making is still considered an art form that requires care and detail. That’s why Entry Brite has assembled a team of fine artisans to make all of our stained glass front doors and custom windows. You can view their work on our gallery page. If you’re interested in adding stained glass to your home, be sure to call Entry Brite in Las Vegas. We can effortlessly transform your home by remodeling your entryways and adding brilliant stained glass to any room in the house. Contact our artisans today to find out more.